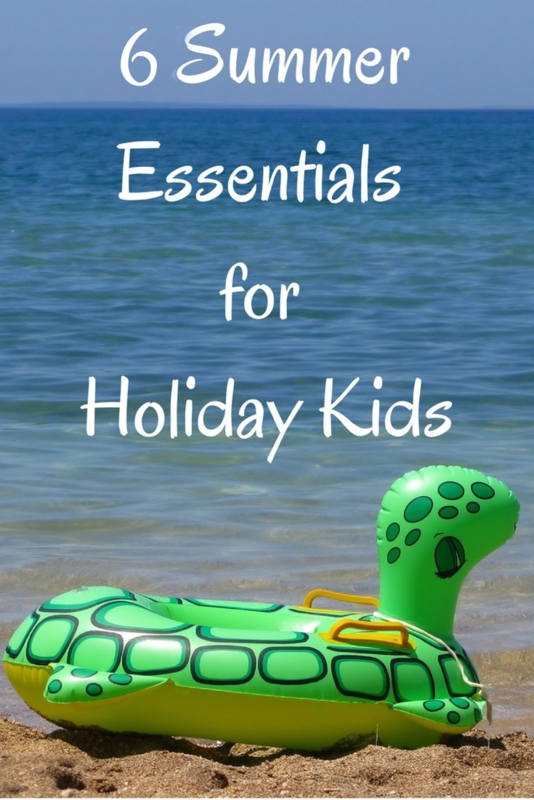 We've been lucky enough to have two wonderful holidays this Summer and currently Bud is in Spain on holiday with his Grandparents, Aunts, Uncles and Cousins so I thought I would share some of the fab products we have been using to make holidaying with small children easier. 1. Snoozeshade* - LM is approaching two years old but she still enjoys a good nap in her pushchair. When the sun is blazing and you're using a lightweight pushchair for ease of travelling it can be really difficult to ensure that your little person is protected from the sun. Snoozeshade works by clipping over your pushchair and providing a cover which offers a fully breathable, UV and light blocking protective cocoon for your child. 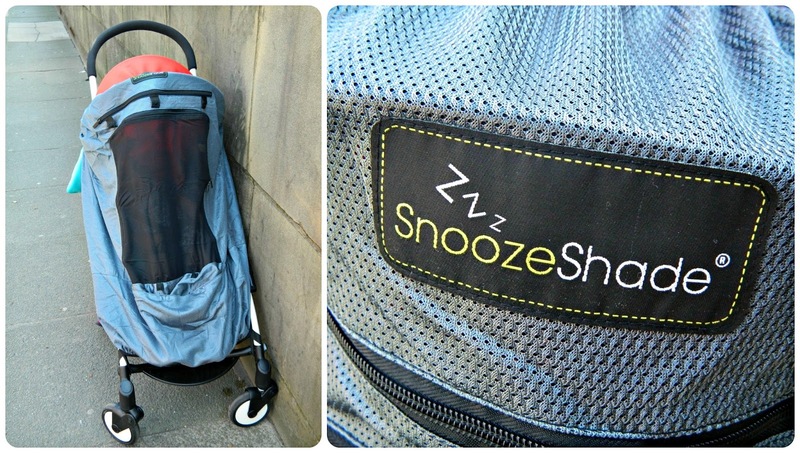 We've been using the Snoozeshade Plus Deluxe and it covers all of the my pushchairs. The Snoozeshade keeps out the light which means LM can nap peacefully and I can honestly say that she sleeps better in her pram with Snoozeshade attached than she does at any other time. With alarming research showing just how high temperatures can reach in prams covered inappropriately it's so important to ensure that any cover used, especially on a pram, is breathable. Snoozeshade really is a brilliant product, I've been asked about it so many times by people who have spotted it on our pushchair and don't hesitate to recommend it. When it's really sunny we try to keep her covered all of the time, with the cover open. It's super easy to fit using velcro loops to attach to your pushchair frame. With versions available for car seats, all types of pram and pushchair and even travel cots, there is a Snoozeshade, or two or three, for every family. Check out http://www.snoozeshade.com/ to see the full range. 2. 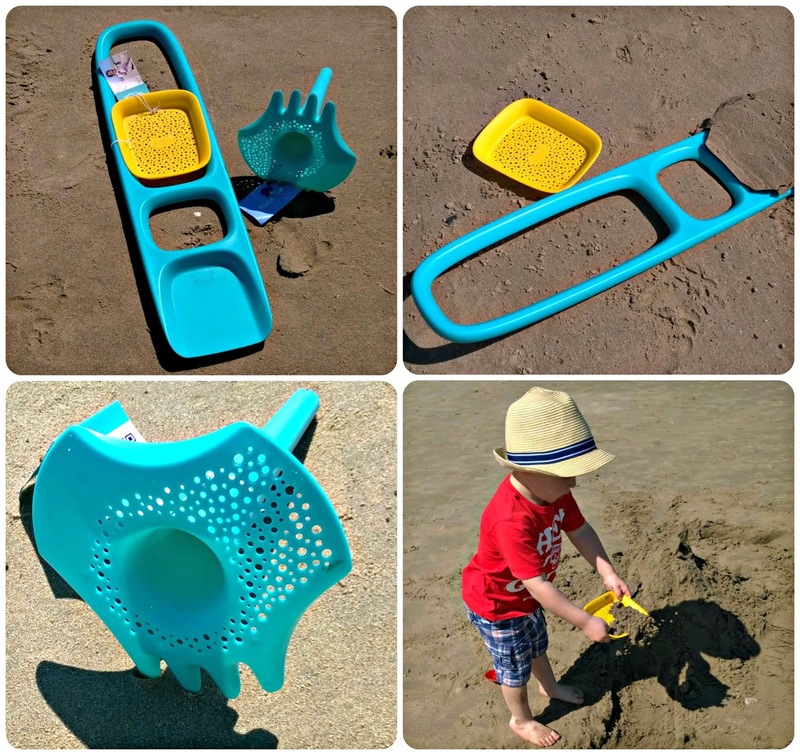 Quut Beach Toys* - It's really easy to pick up a cheap bucket and spade from the beach kiosks when you are on holiday but trying Quut Beach Toys means that they will probably start to look inferior quite quickly! Quut are a Belgian company who make 'real, durable, clever designs that offer fun and beauty for kids and parents to enjoy.' We've been trying out the Scoppi and Triplet and took them to one of my favourite beaches - Saundersfoot in Pembrokeshire. Scoppi is a large sand shovel, complete with square, detachable sand sifting pan. It's brilliant. They can use it as a hand shovel or like a spade and dig with their feet. It shifts a good amount of sand easily and four year old Bud was able to dig with it just as easily as his Daddy (who was quite taken with it!) You will never view a bucket and spade in the same way again. Triplet is a three in one tool. Part shovel, part sand sifter, part rake. This is the tool you need for the finer details on every sand castle. You can use it to dig smaller amounts of sand, sift out shells and other things and then rake to make designs. Bud also used the handle to make little holes around his castle and, if you have water you can use the handle as a funnel to direct it wherever you like on your sandcastle. It's the very definition of multi-use and was employed to great effect on our beach afternoon.Quut Beach Toys are available from Toyella and Not on the High Street. At around £17 for the Scoppi and around £7 for the Triplet they are more expensive than those beach bought toys but they are an investment and will last for years. We'd definitely recommend them. 3. Jowsa* - travelling with babies can be a difficult. Aside from the actual practicality of making sure little ones are happy on the journey, they need so much stuff! They need nappies, food, swim nappies, not to mention Calpol, sun cream, the list goes on and on. Your children's needs can quickly eat in to your luggage allowance and under twos don't even get their own allowance on flights! To save suitcases full of nappies, or mad supermarket dashes on arrival at your destination there is Jowsa. Jowsa - the Nappy Genie - is a one stop shop for all of your baby essentials which allows you to order everything your baby needs to be delivered to your holiday accommodation! We ordered nappies, swim nappies, wipes and snacks for delivery to our Eurocamp site and, on arrival at our caravan found our boxed delivery waiting on the table for us. It's so much easier than having to remember those essential items (I always forget swim nappies) and the whole process is smooth from start to finish. Prices are on a par with supermarket prices and there is a standard fee of £15 for European delivery. This makes it way cheaper than excess baggage charges and allows you to travel with enough nappies, wipes etc for your journey. They stock all of the major brands which means that you can choose your children's favourite snacks, for a taste of home, and you can continue to use the nappies and wipes your child is used to. Jowsa is a brilliant idea. We used it on a car and ferry holiday but I would imagine that the service would be invaluable to families flying with little ones. I'll be recommending it to everyone I know who will be flying with babies and toddlers in future. 4. 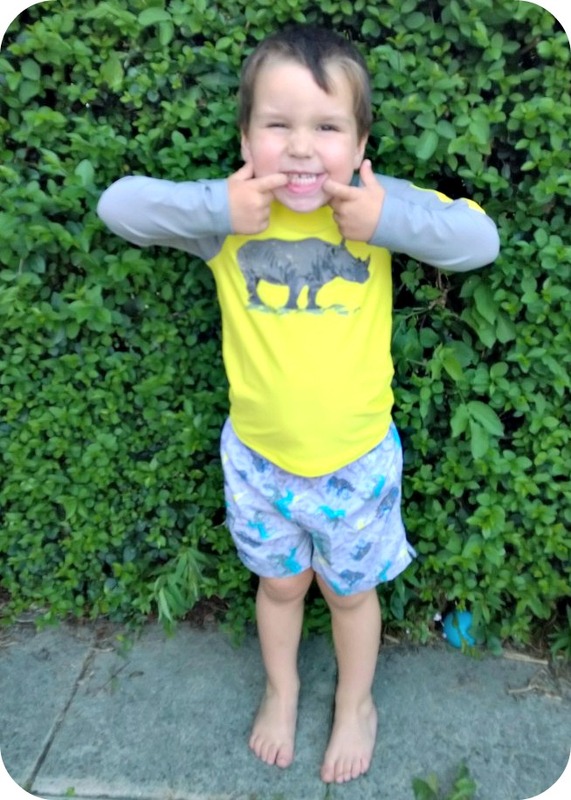 Sunuva Swimwear - recently I was lucky enough to win a giveaway on the Sunuva Facebook Page which offered my choice of rash vest and shorts for Bud. We chose the cool Savannah print - Bud loves animals so I knew he'd be unable to resist the rhino on the bright yellow background. Sunuva make stylish UV protective swimwear, from one piece suits to rash vests, shorts and bikinis. I guarantee that you will find something to suit your child's style. Bud has taken his new rash vest and shorts off to Spain on holiday and I know that they will be getting masses of use as he will be in and out of the sea and pool, he's definitely a water baby! Hopefully he will return with some better photos of him wearing his new swimsuit than his modelling shot! 5. Huggies Little Swimmers*- Both of my children are water babies and love being in the pool or the sea so swim nappies are a must for LM. The best that we've found are those from Huggies Little Swimmers range. 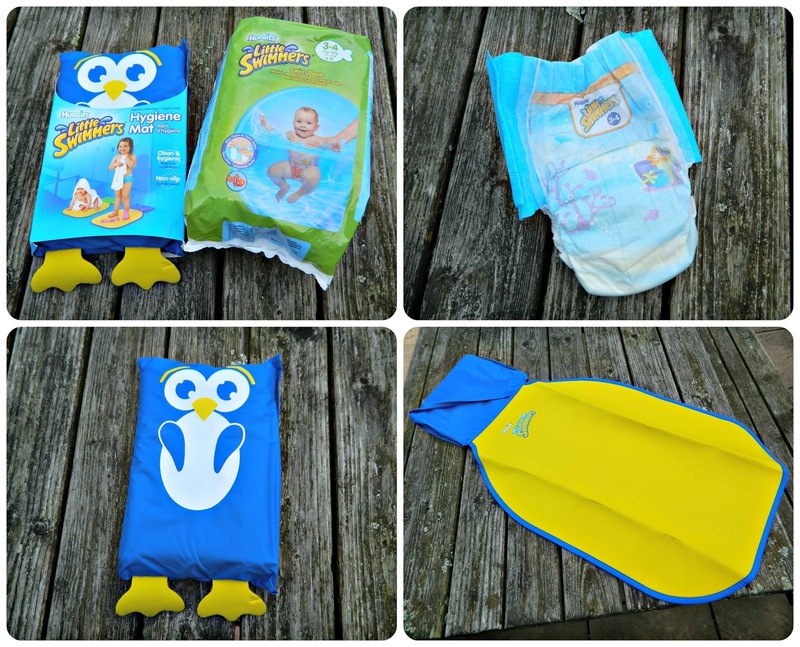 We received some swim nappies and one of their Hygiene Mats before our holiday at Bluestone Wales and they proved very useful. We're already familiar with the swim nappies and they are the only ones I use, they really provide confidence when swimming with little ones, that an accident won't curtail your session in the water. In fact admission includes a Little Swimmers swim nappy at Bluestone and you could buy them in the shop there. The Hygiene Mat was new to me though and we used it all the time. It's a cushioned, non-slip mat to put down on the changing room floor which allows your little ones to stay clean and dry. Perfect for parents struggling with more than one wet child in a changing room! This was great for the wet floor at the Blue Lagoon at Bluestone and Ian and I even found ourselves using it to dry our feet and put on shoes after the children were ready to go. In fact I think I'd take this with me if I was swimming without the children! The mats are machine washable and fold up into their own pouch which keeps them dry. A brilliant product. Huggies Little Swimmers are available in supermarkets and at Amazon. 5. Trunki - Ask most parents their favourite travel brand and they will reply Trunki, I'm sure,. You can't walk through an airport without seeing masses of their suitcases, backpacks and PaddlePaks in use. We have a real range of Trunkis and accessories in our house and I bought Bud a set of Trunkisaurus Rex Trunki chums for his current holiday. The toiletries bag, pencil case and purse were just what he needed to keep everything together in his suitcase and Gruffalo Trunki. When her Grandparents were struggling for ideas for LM's first birthday present, a Trunki was the perfect choice and we added Harley Ladybird to our collection. We use our Trunkis all the time. 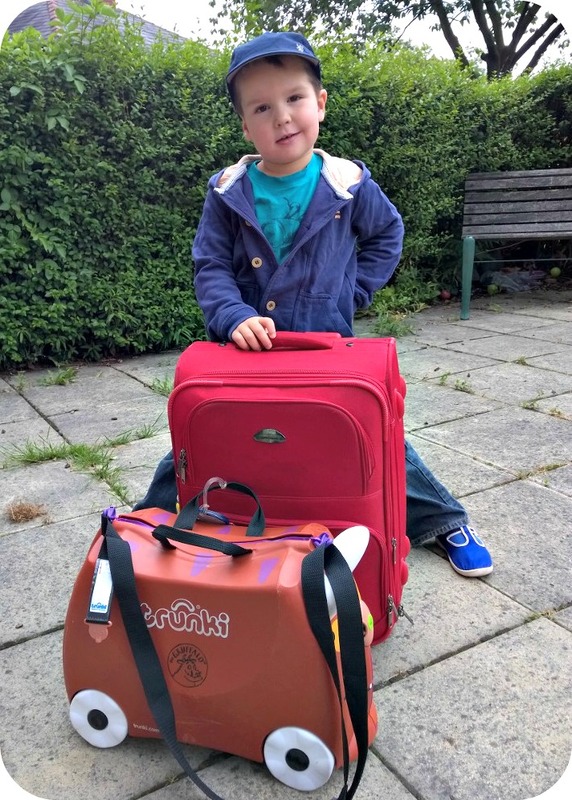 From a night at the grandparents when the children will share one, to nights with friends or even week long holidays like Bud is on now, where the Gruffalo Trunki is his hand luggage, I didn't dream how much we would use them before we bought them. The fact that they can be used as carry on luggage on aeroplanes is fantastic. Bud had magazines, books, a few toys and a full set of spare clothes stashed in his for his flight and I'm sure his Aunt and Uncle were pulling him through the airport on it too! The bright and colourful designs mean that there is something to suit every child, if you are going on holiday with little children you really should check out http://www.trunki.co.uk/ before you travel. What are your essentials for travelling with children? Which one product could you not travel without? *PR Samples. Contains affiliate link.